TPC Overall Rank: #154 out of 2933 rides. This ride is crayz awlosme. I really like this ferris wheel this is the only one I get on beaucuse it rocks back and forward . And this make this ferris wheel really fun and worth geting on. And like some viewrs said is one of the best ferris wheel that I ever got on. How thrilled was I to see the Wonder Wheel reincarnated in a modern form? Well, I was absolutely thrilled and the comparisons between them are inevitable. 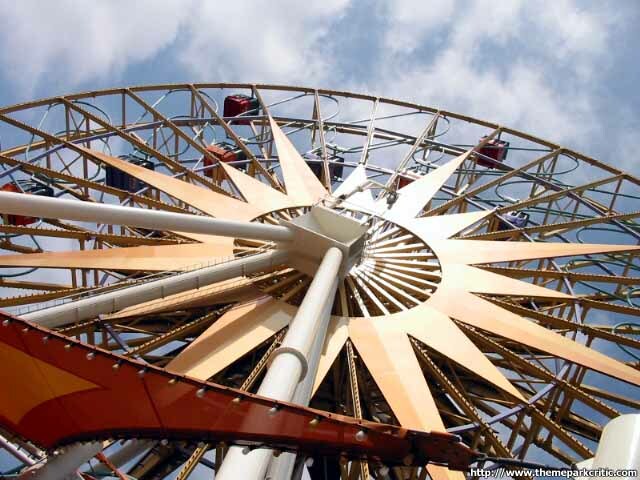 First off, the wheel is an absolute beauty overlooking the park next to the lake. During the ride I had great views of the entire park. Well, at least when they werent swinging. What a treat! 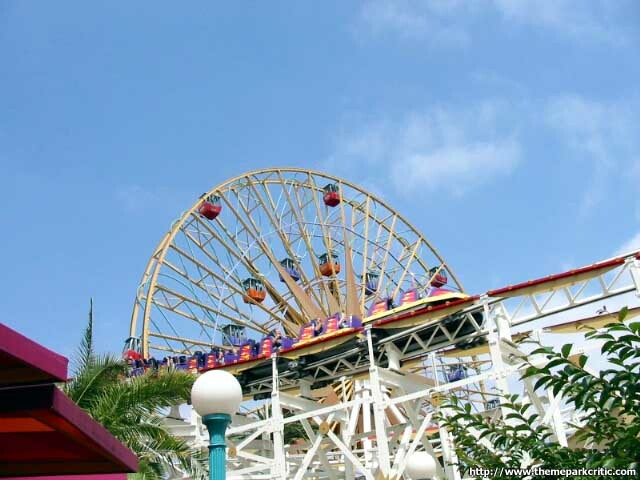 The swinging cars turn what would be a rather tame and standard wheel into a pretty intense and thrilling experience. All of the swinging was really good and smooth, but it just wasnt as thrilling as Coneys Wonder Wheel thanks to how safer this one looks. It just lacks that feeling of "Im gonna die!" The cycle was also shorter than that of the Wonder Wheel, but still the swinging made this a great ride and mixed with those views, a solid number two for my favorite wheels. 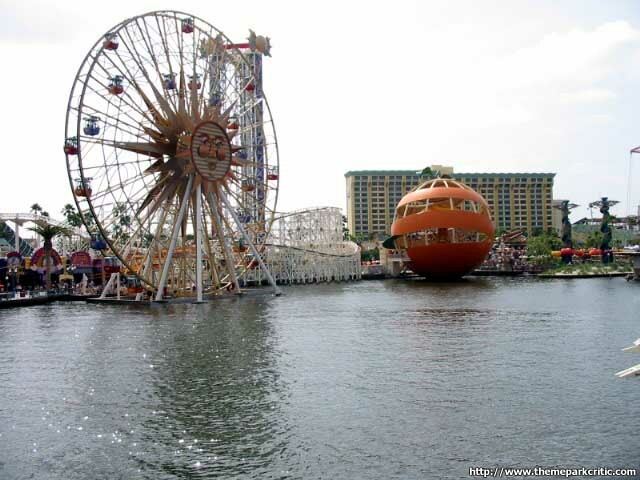 Out of all the big rides I rode at California Adventure, this one scared me the most. When youre going backwards in the swinging cars, it is a very scary experience. The swinging cars make this ride worth riding. 9/10 for a scary awesome time. Probably the best Ferris Wheel I have ever done. We rode in a swinging gondola which really added a crazy element to the ride. Each swing was met with slight terror for myself and some of the others. The views were great, and the lakeside location provides incredible views, however I cant give it a ten because the screens on the gondolas were so incredibly tight that I couldnt take photos without lines through the middle.. lame. This is amazing that I give a Ferris Wheel that high of a rating. This is a Ferris wheel, right??? The swinging cars are so fun, while I bet you that the other cars stink like a normal Ferris Wheel. Did I mention I gave an 8 to a Ferris Wheel (Swinging Cars Only)? With no-swinging (I didnt choose to go on), I bet you that I would give it a 2. The swinging cars are that good. Its fun swinging side to side. It would be just a little better if it want faster instead of waiting for that moment to swing to the other side. When I was on it, it only went around 2 times the gondola. They couldve made it a little longer. holy crud, this thing is TERRIFYING, Im not lying, I can take Tower of Terror, Maliboomer, and Screamin in stride, but when I got on one of these things I flipped, I really cant see how people QUEUE up for this, I like the stable cars much better, I just cant enjoy the ride when it feels your about to fall off the edge of the planet at every rotation, a thrill lovers dream, an achrophobiacs nightmare. Really enjoyable Ferris wheel. Wait time was not too bad, and the gondola provided some great views of the park. The swinging cars made the ride quite exciting. I do wish the ride were a bit longer though. I can ride everything without rservation. . . excpet this, swinging ferris wheel cars freak me out. 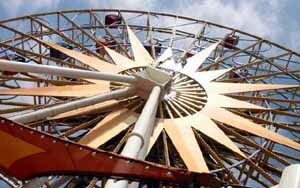 and somehow this one is alot scarier then the whonderwheel at coney island.